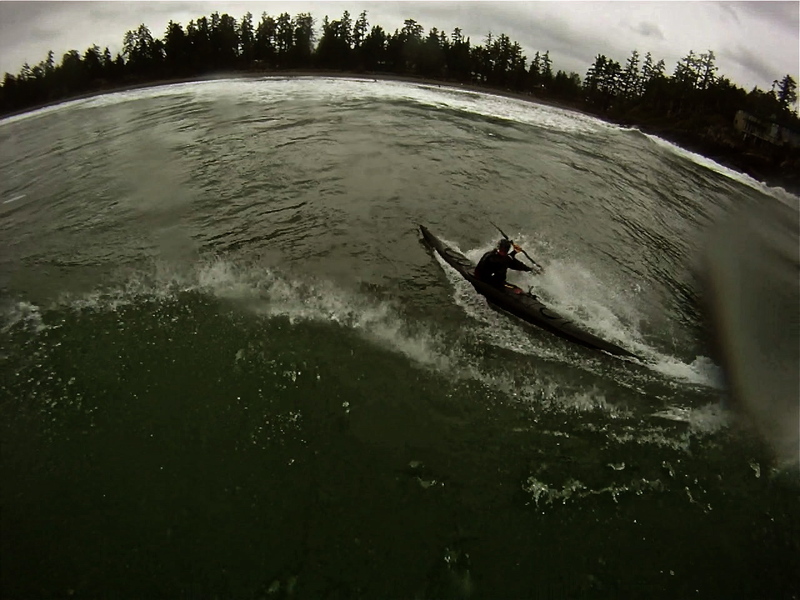 This is a great little video of my buddy Warren rippin' it up down at Deception Pass. She's almost ready! Reg and Sterling have been working OT to get this done - thanks guys!!! Check out this vid of us surfing Sterling's boats at 7:30 am at skook...now that's a great way to start the day! Surge Narrow is a short 15 minute paddle form the DIL and was running at a respectable 7 1/2 knots. Super fun. This technical little waves is a challenging surf. With a confused eddy line, a ferry glide up stream and a small pocket to sit in the Surge wave was a good reminder how important it is to use your hips. Kate, Chris, Tony and Beth-anne lining up for their turn on the wave. With FUN being a major focus in everything that SKILS does, Beth-anne and Tony hit the wave in the South Wind. Possible one of the biggest double kayaks, the South Wind isn't exactly a surf boat but they gave it a go anyways. With a few short surfs and a lot of cheers and laughs from the eddy the the South Wind proved to be a fun way to enjoy the currents. Chris using some awesome hip control. Below is an interview I did with paddlinginstructor.com There's a few weird format errors...but enjoy. Over the past year or so, The Hurricane Riders have been developing quite a name for themselves on YouTube with their crazy rough water sea kayaking shorts. Last week I sat down (via a keyboard) with team member Rowan Gloag in what became the 1st in our 1 part series, Better Know a Hurricane Rider. I wanted to find out the story behind the Hurricane Riders and what keeps Rowan motivated as an instructor. Tell me about The Hurricane Riders. How many members are on the team and how long have you been around? Currently there are 6 members in THR. However, we may increase that number in the future. James Dunderdale and Marty Perry started the crew back in 2007. Several members of the team are also guides and sea kayak instructors. Tell me about that. 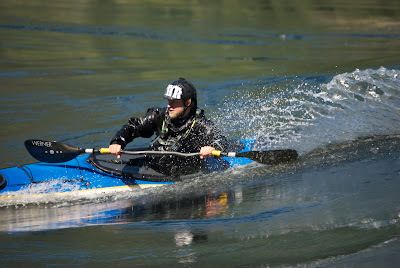 How long have you been instructing for and how often throughout the paddling season do you teach? 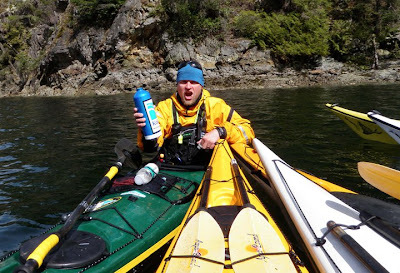 Rowan Gloag (Me) - I am a full-time instructor working for both for Deep Cove Canoe and Kayak (DCCK) and SKILS. I've been doing this since 1998. James Dunderdale is the School Director at DCCK and works for SKILS. He teaches as much as he can. He has been an instructor since 2003. Marty Perry is a full-time instructor since 2007 at DCCK as well. Chris Wilson is a part-time instructor at DCCK since 2001. Pawel Szopa taught as an instructor at DCCK from 2003 to 2009. How did The Hurricane Riders get started? We had been play-boating in long boats for years and originally it was just about paddling long boats in more demanding conditions. As professionals in this industry, we needed an outlet that was just for us, that wasn't work, where we could push our skills. We started off with just pictures, but in 2008 we began shooting rudimentary videos with our point-and-shoot cameras. With no editing experience and armed with a new Macbook, I did my best to link images to music. It was a steep learning curve with over 50 hours going into our first video. 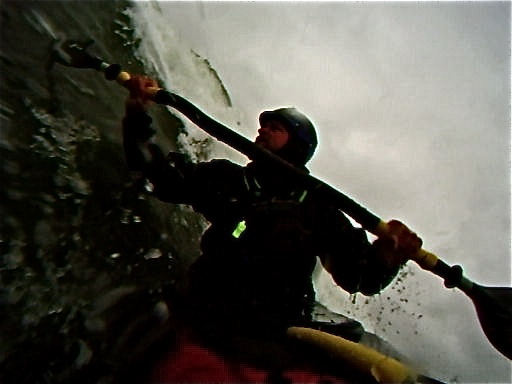 Some people say that your paddling style is influenced by whitewater in that you are basically whitewater paddling on the ocean. Is that accurate? Would you view it that way? Maybe. We do have whitewater experience and we still paddle rivers. But we are sea kayakers, and this is the sea. For myself, a major influence was (and still is) Michael Pardy from SKILS. I took my PC Level 4 Skills course with him in 2003 and he has inspired all of us to get better with every season. I honestly believe that this is just a natural progression for sea kayakers. Well, maybe not the seal launches - they're just for fun. I paddle in rough conditions because it shows me very quickly the holes that I have in my game. As a team, how do you manage risk? In the beginning, did you formally sit down and develop a risk management plan for real-life scenarios or do you keep it loose and depend more on each other skills? I'm really glad you asked this question. Due to the nature of YouTube, we can't explain everything that goes into our "stunts." Yes, we sat down and wrote our Incident Response Plans (IRP's). We discussed mandatory safety equipment, incident protocol, and communication standards. Most of the crew are certified Paddle Canada Level 4 paddlers so the sea kayaking skills match the conditions we are paddling in. The classic question, any close calls? Close calls - that depends on what you mean. I did get stuck in a boat two years ago. I capsized without my paddle and my legs were trapped in the cockpit. That was a long 47 seconds. I was scared. As for collisions - yes. As for injury - kinda, but nothing resulting in a trip to the hospital. Personally I need to be injury-free to work so I’m a pretty timid paddler. With a pre-paddle safety meeting, rescue and safety equipment, and IRP's in place, I feel pretty safe paddling with this crew. For me, the best part of teaching is facilitating change. Students generally come with a boatload of enthusiasm, but lack the technical skills for success. Using the right form of communication, students can achieve new skills, confidence and an amazing sense of pride. This can happen even when teaching something as simple as the pulling draw. What motivates you to be a better instructor? My students. I really enjoy watching people go through the learning process. The challenge of customizing each session to students’ own learning styles keeps me motivated to learn more teaching techniques. That, and sea kayaking is pretty dope. How do you keep the passion and interest for teaching alive when you find yourself constantly teaching beginners how to forward sweep over and over again? I don't get discouraged by constantly teaching beginners basic skills, although I have struggled with keeping my passion. In 2007, I lost it. I left the industry, sold most of my gear and went back to school then started a new life as a deck hand for a local tugboat company. The funny thing is that I missed teaching so much that I quit the tugs and came back to the industry. I can honestly say that I'm doing what I'm meant to do. I do this job because I love it, and that's it. I think passion is like anything else. If you don't use it, you lose it. For me, I do two things: I schedule a few challenging contracts every season and I make THR videos. After you started pushing the envelope and getting out in bigger water, were you able to channel that knowledge and experience back into being a better instructor? Yes, THR has had a huge effect on my teaching ability. There's nothing better than experience to refine your skills. THR has made me reassess everything that I originally thought. For example, I teach edge control and bracing very differently now than I did before. I am a "watcher' and "feeler" style learner and this has allowed me to dissect basic movement and therefore helped me be a better instructor. Some people feel that the goal of The Hurricane Riders is to change and push the sport of sea kayaking to a new level. You say you are not out to do that. Yeah, I don't think we are doing that. Maybe we are, but it doesn't feel like it. This is a part of sea kayaking and always has been. People have been paddling like this for years. The only difference is we are using YouTube to spread to word. A few years ago, we met Warren Williamson at Skookumchuck. 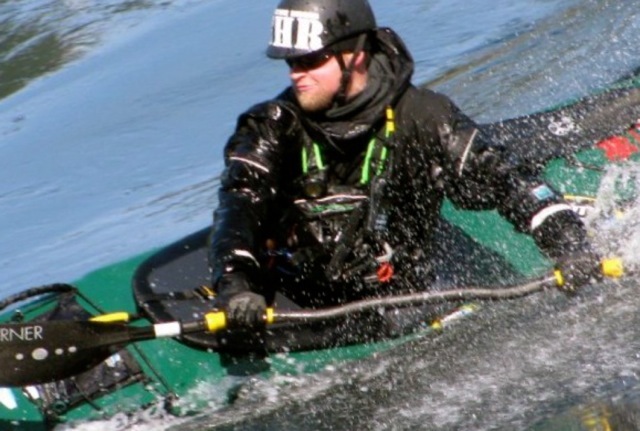 He has been paddling ocean boats in currents for over a decade. I took my Paddle Canada Level 4 Skills in 2003. The Romany was conceived in 1979. The Tsunami Rangers were surfing in rock gardens when I was playing T-Ball. We’re not pushing sea kayaking to the next level...we just have a different soundtrack. Where do you see sea kayaking going in the next 5 years? Boat and paddling style is something that I am very passionate about. I have the honor of helping Reg Lake and Sterling, from sterlingskayak.com, on a very exciting new project: the Reflection. 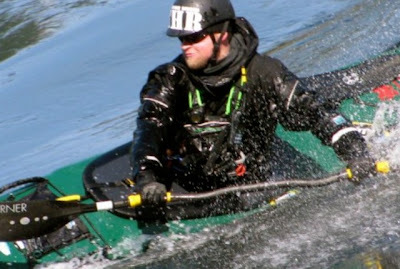 This is a sea kayak designed for playing in big water with back surfing as a focus. It reminds me of '97 when Salomon released the 1080's, the first pair of twin-tip skis. Back surfing is one of the coolest experiences I have ever had in an ocean boat. As far as paddling styles, I hope we see more THR-style crews come up and start laying down some sick style. You guys make videos. Tell me about them. What have you done and which one are you most proud of? I make the THR videos for us to keep our stoke up between trips. As a result of posting them on YouTube, other people watch them too. Honestly, I'm flattered by the support, comments, and viewer counts. With almost 100,000 views, it's a little overwhelming at times, but at the same time it makes me want to make more. We aren't going to make movies for sale. YouTube only. Free for you forever. Enjoy. October Sessions is our most recent video…I’m pretty proud of it. As we move into the cold season we need to remember to stay safe. Be prepared...please. Please watch at 720p. Check out this short teaser style video from our last trip out to the west coast. It seems like a dream. Staying at Chahayis, a stunning house on South Chestermans is beyond compare. www.chahayis.com . Every October for the past 10 years we, the Deep Cove and THR crew, have headed out to surf the west coast swell. With a group of committed paddlers and film makers we spent 5 days surfin' it up on south chesty's. Amazing. Marty heading out for a solo storm session...big props Mart! After years of using WW or short boats the crew has slowly migrated to long boat surfing. Ridiculous. With 4 Romany Surfs, 2 Chatham 16's, a Capella 163, and the new Carbon Grand Illusion, we hit the beach ready to surf. Long boats are amazing in the surf. The length makes it easier to punch through foam piles and chase down most waves. However, once on the wave the speed is intense and the beat downs are violent. One broken boat, one broken paddle, and one dislocated shoulder. Leaving the Romany Surf at home, I was lucky enough to use Sterling's Carbon Grand Illusion. A boat that is designed for expedition paddling shouldn't be that maneuverable, right? No. I absolutely loved this boat. 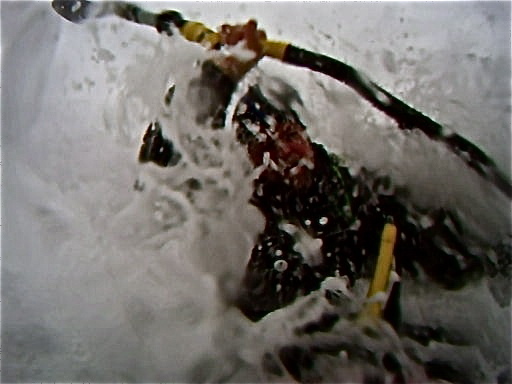 Being able to change direction on the waves with a stern rudder and edge control gave me huge confidence in the surf. With ample rocker and buoyancy at the stern I was able to continue to work on back surfing, linking edge control with bow pries, leading to my longest and most controlled back surfs ever. Thank you Sterling. sterlingskayak.com . I will post a full boat review after I test it on a camp trip. Dropping in switch on a nice wave. Thanks to Kim for swimming to get this shot. Ripping switch from a different angle. Sorry about the quality - it's a still from a vid. I'd like to extend a special thanks to Nick, Val, Whirl, Marty, Bram, Jack, Kim, Dave, and Kate for making this year's trip unforgettable. I'd do it again in a heartbeat. 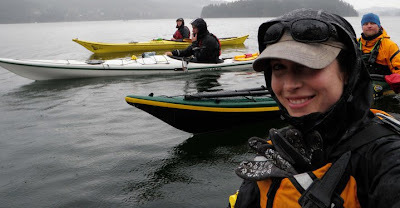 This year Deep Cove Canoe and Kayak hosted the SKGABC fall exchange. Thanks Dunder! We spent the weekend at a rather urban, yet beautiful campsite on Howe Sound. With sunny warm days, calm water, and a relaxed group of paddlers we enjoyed rolling sessions, kayak olympics, and happy hour. On sunday we worked on scenarios and rescues...thanks Liam. My Romany and Gulfstream are just not big enough anymore. As I'm starting to run more overnight programs again, I need a boat that I can use for multi-day commercial guiding, OB programs, and PC Level 3 Skills course's. So I need a higher volume boat, however maneuverability is extremely important to me...I don't want to paddle a boat that just goes straight. I'm hoping that Sterling's Grand Illusion will solve this problem. Sterling's has been extremely generous and lent me his Carbon GI until early November. So the plan is to "test" this boat in a variety of conditions. I brought it with me last weekend to the SKGABC fall exchange. skgabc.org I wanted feedback from guides that spend more days in the field then me. Well, it was a hit. Next I'm heading to Tofino for a week of kayak surfing, then off to Surge Narrows for the SKILS retreat and year end meeting. skils.ca I'll put out the completed report in November. To top off one of my best seasons ever, I had the opportunity to work with SKILS and Outward Bound on a course in the Gulf Islands. It was outstanding! I was very lucky to work with Kate Hives, she was amazing. We spent a week with a polite, eager, and absolutely hilarious group of grade elevens from Toronto. It was an an honour to be "pinned" and I look forward to running OB and SKILS courses in the future. Please watch this vid at 720p...This is footage and commentary from my "test" of Sterling's new Reflection. The brain child of Reg Lake, the Reflection is one of the most playful boats I have tried in years. I'm not one of Sterling's employees nor am I a sponsored paddler - this is just my honest review of their new boat. For more information or question please feel free to message me. We went to skook last weekend and I had Sterling's new Reflection prototype. It surf's really well - the boat carves like you wouldn't believe. It back surfs really well too. Thanks Sterling! Reg Lake is my hero! 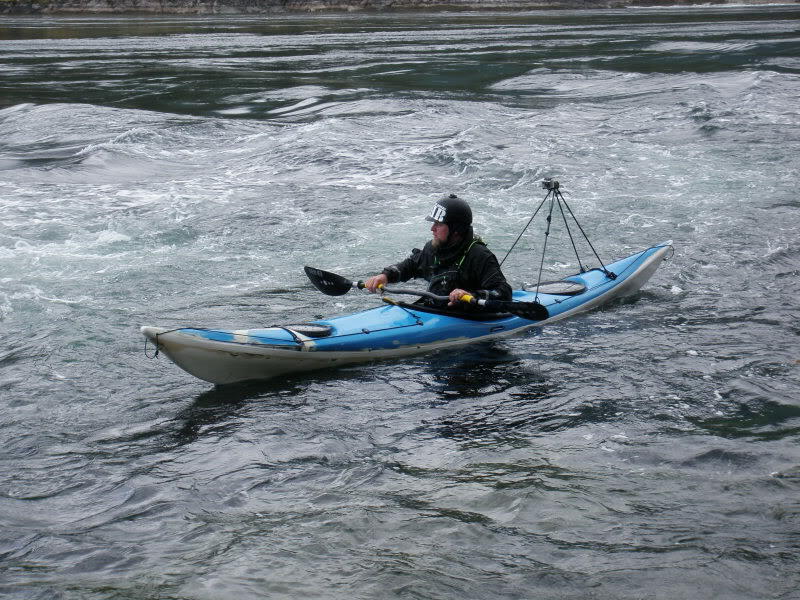 He and Sterling have been working on a sea kayak that's designed for big water play sessions. The Reflection was created with back surfing in mind! How many sea kayaks do you know that are designed to back surf? The prototype didn't look all that pretty, but it could surf! When I bumped into Reg and Sterling at skook Reg had brought his new creation with him. I was speechless. It's like they went into my brain and stole all my ideas. I was super pumped to give it a go on the wave. As a dedicated Romany paddler I thought that I was already in one of the most maneuverable "play" boats out there. Well I was wrong. The Reflection blew me away. The second time at Skook it showed up with a new paint job...nice! So...I get to work at Skookumchuck. I don't know how I got so lucky...but it's a dream come true. This year we took Rory, Mark, and Mark. Rory rippin it up on the wave. For the course we met in Deep Cove twice a week for 5 weeks. Classes we introduce the skills and theories needed to safely paddle in areas of current. Practices were on dates chosen by participants and we we used practices to solidify the skills taught during our classes. For overnight trip we met at Egmont Marina on the Sunshine Coast backeddy.ca where we spent two days learning and building confidence in the dynamic waters of the Sechelt Rapids. 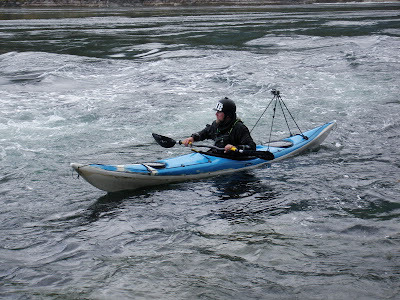 The course covered topics such as edging and bracing, rolling, moving water recoveries and rescues, crossing strategies, predicting time, speed, and direction of currents, navigating through currents, dealing with evacuations, assessing and avoiding hazards, and paddling techniques for dealing with eddy lines, eddies, boils, whirlpools, and standing waves. The course was challenging, tiring, and absolutely unforgettable. Thanks guys! Hooksum Outdoor School runs a West Coast Outdoor Leadership program. This intensive 28-day Training provides a solid foundation of outdoor and leadership skills and competencies. 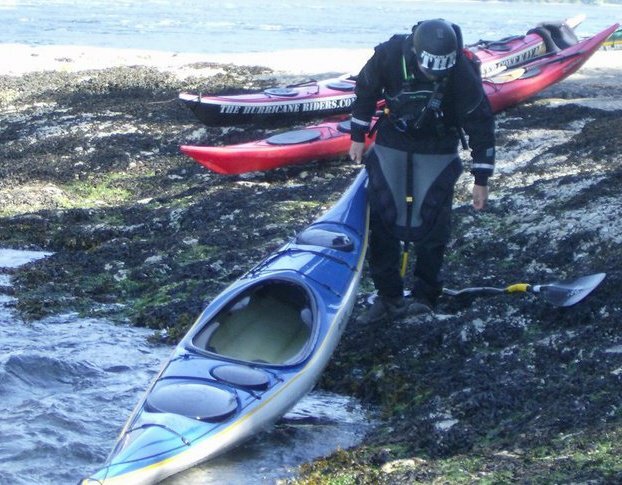 Hard skills — certifications in advanced wilderness first aid, lifesaving and sea kayaking — are taught in accordance with current professional standards. Learning about the natural world of Hesquiat Harbour, and indigenous values and culture is included in all activities. Using adventure-based, experiential learning, participants will gain the skills and knowledge necessary for safe and practical outdoor group leadership. Stinky dead Grey whale. It looks like it was attacked by Orcas. There was large bit marks on the tale. Marty and I running a morning session...so beautiful. I ran the PC Level 2 Skills courses for them. The program was excellent. We saw whales, bears, eagles, and speculator intertidal life. The students worked very hard, the location is outstanding, and Karen's food was amazing! Thank you Karen and Steve. I can't wait until next year! As much as I love teaching skills courses...I really enjoy running Instructors courses. After we completed our Level 2 skills course with DC's new crew we then tackled the L1 Instructors. Working with Mike, Jack, Megan, Erin, and Kate was exhilarating. Thank you guys! We play a game during my courses to stay hydrated. It's called cheers. Each group chooses what to say when we "cheers". This group it was Slangevar - Scottish Gaelic - to good health. The group paddling around the north side of Dodd. Taver finishing a quick and easy solo rescue. Megan, me, Jack, and Kate on the overnight...it was a little drizzly. I was lucky to run the PC L2 Skills for Deep Cove Kayak School this year. I always look forward to working with DC's new instructor team. They are so excited, focused and willing to improve their paddling skills. Thanks to Jack, Kate, Erin, Megan, and Rocky for making this an excellent course. This year the staff at Deep Cove Kayak headed to Skookumchuck Rapids! It was awesome. For some of our staff it was there first real introduction to paddling in currents. The focus this year was to enjoy "park and play" kayaking, develop an understanding of learning styles and skills progression and of course...have a little fun!